It’s that time of year again! 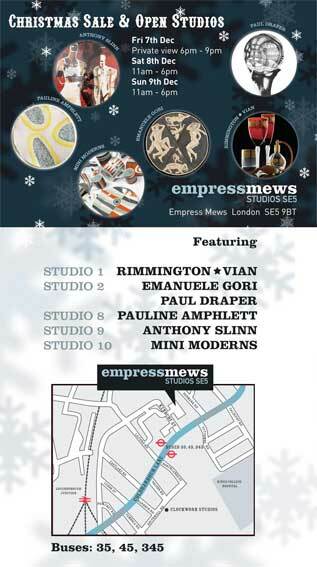 For the 5th year running, Mini Moderns will be hosting an open studio along with the other artists and designers in our SE5 studio complex. We’ll have our entire range in stock, so you can pick up christmas gifts, as well as wallpaper sample books to browse and sample cuttings to take away. We’ll also have our new paint and fabric range on display. On top of all this, we’ve got some fabulous end of line and sample bargains for you. Our studio sale coincides with the Clockwork open studios weekend, just over the road from us – so there’s lots more to see in the area. Hope to see you at the weekend!